The photo challenge for this week invites photographers to consider what a circle represents. 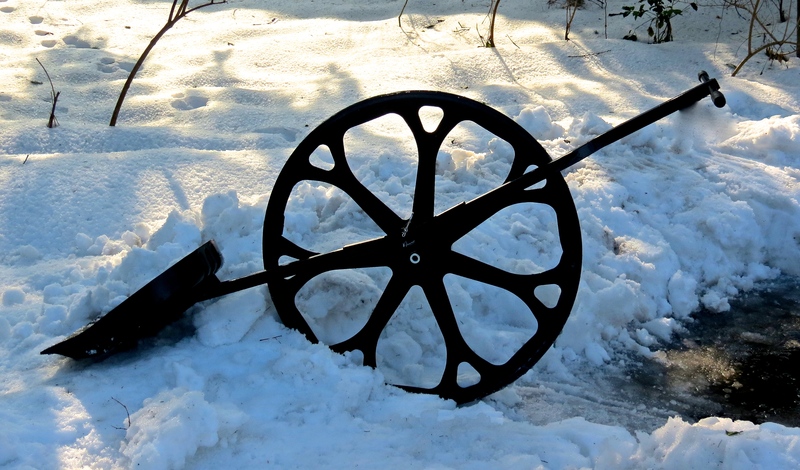 What came to mind was this snow shovel invention, which makes use of a wheel to create a fulcrum to lift snow. Last year the total snowfall amounted to over 58.4 inches in our area, all of which had to be removed from the drive and walkway. Because the drive is shaded, the snow freezes making a nice, slick patch of ice to negotiate. Wheel technology continues, as I ponder when the first human conceptualized this circular device about 3,500 BC, making life easier for us all. Happy New Year, John. If I wasn’t so cheap, I’d get one of the those motorized devices! lol . . . which I might regret if it snows two feet or more. I live in upstate NY. Just bought a Wovel and got a chance to use it right after Christmas. Heavy, wet, frozen snow a couple inches deep. Would have taken all day without this amazing invention. Takes a little practice, but once you get the new technique it’s so easy. I was still sweating, but no backache or soreness! Wow, I want one of those, although it would have been used more when we lived in the snow belt of NE Ohio rather than the SW metropolitan area of Chicago where we don’t really get much snow. For years, I just used a standard shovel, which was fine. For deep snow, the Wovel made the job doable, especially when the street plow piled the snow up at the end of the drive! I know from bitter experience how heavy that snowplow snow can be! I’ve never seen anything like the Snow Wovel. It sounds wonderful. Happy New Year–I hope that you have a wonderful 2016.